Gelso is a spacious villa, traditionally restored, with a welcoming atmosphere. It has a warmth inside with lovely curtains, comfortable sofas, large dining room and is furnished with some antiques of the owners family. It is bright and airy inside and sleeps 8 people with 4 bedrooms. There is a cottage in the grounds that sleeps an additional 4 people, please ask if this is available in 2019. Mediterranean herbs, fruit trees, panoramic views, barbeque and a secluded swimming pool makes your summer holiday complete. Villa Gelso is a romantic hideaway just inside the National Park, full of adventurous walks to places of myth and legend, Visit 'Hell's Gorge' 'Paradise Hill' The 'Rebel Friers Caves'. Tourist maps and leaflets are supplied and a maid service if required. Linen and towels are provided, and a welcome pack of some essentials and food can be booked in advance. The owner is available for help and advice. Things to Do: Sandy beaches, Mountain drives or walks, Swimming/sunbathing at Lake Fiastra, Tour of Vineyards - winemakers, Roman Ruins, Renaissance Art tours, Shopping - Italian Outlet Stores, Italian handmade shoes, Churches & Abbeys, The opera festivals in summer, Local markets and festas, Medieval costume re-enactments of battles and palios, Cave exploration at Frasassi, or just stay by the secluded sunny pool. I was born in Venice, but have been in Marche region for nearly 30 years and the mountain scenery stills takes my breath away. I speak English and with the help of my English partner we can advise you on where to go and what to see. I have been welcoming guests for many years and Villa Gelso is my favourite, in fact I had a holiday here myself last summer. The location is stunning, secluded and peaceful but only 10 minutes from Amandola and Sarnano. I fell in love with the views! DVD and TV, music system. Chess, cards and board games supplied, together with paperbacks and tourist information. We had a fantastic holiday at Villa Gelso. From the moment we were greeted and led to the villa by the super friendly owners Sally and Marco we knew we were not going to be disappointed. The scenery on the road to the villa is spectacular and once you arrive you realise this villa has prime position overlooking the mountain view. The pool was a big hit with the four children who came with us and the villa itself was plenty big enough for two families of four to do everything we needed and not get under each others feet. The location is peaceful but only 10 minutes by car from Amondola and the supermarket, bars and restaurants there. We day tripped to the coast, the lake at fiastra, the caves, Ascoli and to Asissi and had a wonderful time getting immersed in the real Italy. Kiss me quick the region isn't but if you want a relaxing holiday amongst beautiful scenery with some Italian culture you can't do better. Marco and Sally were helpful and interesting hosts for whom nothing was too much trouble. We will definitely be going back in the future. Thank you for having us in your beautiful villa. Thanks so much for your review, we enjoyed meeting you all and so glad you enjoyed your stay! This property is fabulous. It really has everything, fabulous views, great facilities and welcoming hosts Marco and Sally. The main house is light and spacious with 3 doubles bedrooms and one twin. It also has a good sized bathroom upstairs and a shower room downstairs. The cottage is cosy with 2 double bedrooms and 2 bathrooms. The pool is a good size. The property is private and extremely quiet with only local families in the hamlet. The views from the grounds and the main villa are amazing. We did experience a 6.2 magnitude Earthquake whilst staying in this property with the epicentre some 20 miles distant. The property appeared to suffer no effects from the quake. Marco and Sally have renovated the properties to the highest standards making sure that they comply with all regulations regarding buildings in Earthquake zones. There are many historic hill towns, markets and festivals in the local region as well as opportunities to go in extended walks and enjoy the great outdoors. As an extended family of brorhers, sisters and their partners we general rent a large property for an annual break. This property was certainly one of the best that our extended family has stayed in. Hi there, thanks for your review, so glad you enjoyed your visit. The "Event" will entertain dinner guests for months! No damages to the houses. Thankfully quakes of this magnitude are extremely rare and hopefully that's finished now, for another 20 years! This is a first class property in almost every way, so let's get the downsides out of the way upfront. Villa Gelso is not walking distance to the local towns of Amandola and Sarnano. These are a 15 min drive away, so no strolling down to the village for that morning cappuccino or evening aperativo. And Le Marche does not have a museum, art gallery or Michelin listed restaurant in every village, nor does it offer an 'all hours' nightlife. It is, in that sense, relatively rural, remote and decidedly not Rome or Milan. However, that was exactly what we wanted. A private and comfortable establishment where a large extended family could hang out around the pool or garden, do many of the excellent walks ( or, for the cyclists among us, rides) in the surrounding mountains, or explore Le Marche villages, cafes and restaurants without sharing these with the large numbers of fellow tourists that have now taken the pleasure from many other places in Italy. Villa Gelso is spacious & well equipped, the wifi works very well, and few home comforts are missing. Some of our tribe complained about the odd insect, but most thought that the biodiversity was entirely manageable, with or without chemicals. We didn't do the Le Marche outlets, but heard others had enjoyed a day doing some of these. Owners Marco and Sally could not have been more friendly & helpful. Overall, a very attractive value proposition. Sally and Marco are exceptional hosts which was reflected in every aspect of our stay. From the outset, even before we arrived at Villa Gelso, Sally and Marco did everything to make our trip a complete success. They advised on the best ways to travel, organised a food parcel for our first night and ensured the kitchen was stocked with condiments. Communication at all times was easy and immediate. We will always treasure memories of Sally and Marco's generosity and thoughtfulness. They left a library of guidebooks and information leaflets, and gave freely of their time advising us on the best places to go. The villa is in an area of outstanding unspoilt natural beauty. The villa itself is spacious and comfortable, with a striking brightness of natural light in all the rooms. The bathrooms were luxurious and the generosity of our hosts was reflected in the plentiful provision of towels, toiletries and sundries. The spacious and tastefully decorated bedrooms had extremely comfortable beds and plenty of storage. The kitchen was our dream kitchen, well-designed for cooking and entertaining - with all the equipment you'd want and more! The WiFi is excellent, and all in all, the villa is equipped to a very high standard with no expense spared. A car is necessary, and the following is a list of places we would recommend: The medieval towns of Amandola, San Ginesio, Sarnarno and the medieval abbey of Abbadia Di Fiastra. The Thursday morning market in Sarnano is worth a visit, especially if you'd like to come home with a souvenir of a leather bag or pair of shoes:) Take time to read the walking guides in the Villa, as there are some wondrous walks in the mountains. We had fabulous mountain days exploring glacial lakes, hermits' caves and canyons. On sunny days we went to the beaches for a dip at the superb Riveria de Conero and the more touristy Porto San Georgia. From the time of our arrival we were overwhelmed with the beauty of the area and we never ceased to be in awe of the stunning scenery and the secret treasures nature revealed every so often. One night a porcupine family lumbered across the road lit up by the car headlights, and on another dark evening a large litter of baby wild boars and their parents ran all round the roadway in disarray! It was lovely to be in such a private space, and we felt like we were the only people on top of the world, sharing our space with unspoilt nature ! Highly recommend this property. Hosts, villa & area superb! Thanks so much you guys for this glowing review...I hope people don't think we wrote it ourselves ! So glad you had a great holiday and enjoyed our beautiful area. This is a fantastic house and we really enjoyed our stay. Having the extra rooms in the cottage was particularly helpful. The whole family really enjoyed the pool. Thanks so much for your review, we loved to see you all smiling and happy. The additional cottage is perfect for large groups of family and friends. We thoroughly enjoyed our stay at Villa Gelso. It was a perfect family retreat for both our Italian and American families to meet and take advantage of the serenity and beautiful surroundings. We were able to accommodate everyone comfortably from small children to grandparents. There was plenty to do just at the house, between swimming, hiking, cooking, and just relaxing. We loved that it was so quiet you could just listen to the breeze and birds singing. We were surrounded by blooming flowers, trees and the literally every view was breath-taking. We would drive the short distance to Amandola or Sarnano for shopping and restaurants and took advantage of the local flavors and ingredients to make some amazing meals at the house. We would highly recommend staying at this Villa if you are looking for a clean, spacious stone farmhouse to accommodate multiple families, have a large kitchen and eating area, want to take advantage of the mountain air and enjoy outdoor activities, and most of all tranquility. Thanks so much for taking the time to review Villa Gelso. We hope to see you again another year. 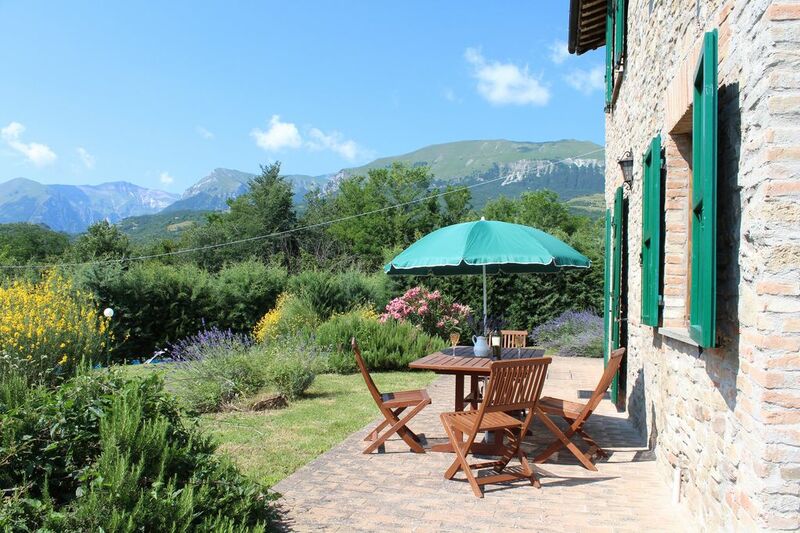 Located in the beautiful marche region of Italy, just inside the Sibillini National Park, Villa Gelso is a dream holiday home for self catering. With stunning views and on a quiet 'white' road it is in a peaceful rural location, with ever-changing scenery making it a captivating place. Only 10 minutes by car from the village of Amandola and the medieval hill-top town of Sarnano, Gelso is also not far from impressive historical and cultural towns such as Macerata and Ascoli Piceno, with their cathedrals, art museums and of course, designer shopping! For the lover of Italian fashion, Marche is home to a number of designer outlet stores such as Prada and Armani, and shoe factories with outlets, such as 'Tod's'. Visit the churches with wonderful paintings, the Abbey of Fiastra, the Roman ruins of Urbs Salvia, the 14th c. frescoes in Tolentino, the incredible Frassasi Caves, wine-makers and vineyards, lakes and mountains, beaches and genuine local Italian food! Its all here for you! Also Pescara and Perugia & Rome Airports are possible. From June 2018 EasyJet are flying from Gatwick to Ancona.